WE HAVE a winner. In the sweepstakes that is the Lakers coaching search, Mike Brown owns the lucky ticket. ESPN broke the news late Wednesday that the Los Angeles Lakers will name Brown the 22nd head coach in the history of the storied franchise. Brown is expected to sign a contract in the coming days, and he will be paid a king's ransom -- $18.25 million for four years. Megastar Kobe Bryant, who has publicly endorsed longtime Lakers assistant Brian Shaw to inherit Phil Jackson's vacated job, won't be expected to do any cartwheels to celebrate this recent hiring. But given Brown's impressive track record, Bryant probably won't be sulking, either. In his five-year stint (2005-2009) as head coach of the Cleveland Cavaliers, the 41-year old Brown accumulated a won-lost record of 272-138. He guided the Cavaliers to the 2007 NBA Finals --- a quest that was thwarted by the San Antonio Spurs --- and was named NBA Coach of the Year in the 2008-2009 season. With the likes of Jeff Van Gundy and Rick Adelman on the free agent market, it can be argued that Brown is not the best coaching mind availble . Heck, Mike might not be the best Brown available after Larry and Hubie. But the Lakers are hoping that Mike Brown's past success and defensive mindset will serve the purple-and-gold well. 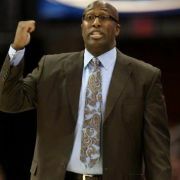 Prior to landing his big break in Cleveland, Brown had served as assistant coach to Dallas Mavericks head coach Rick Carlise and Gregg Poppovich of the San Antonio Spurs. In other words, Brown didn't just pluck hoops lessons from a basketball manual. He learned from the best. "He's a great coach," ex-Cav turned Miami Heat LeBron James told reporters Wednesday afternoon as news of the celebrated hire filtered around the NBA. Brown doesn't have neither the flair nor the charm of the Zen Master. And he doesn't use the Triangle, an offense that is so ingrained in the fabric of the Lakers attack. Click here to view a list of other articles written by Nicholai R. Roska.